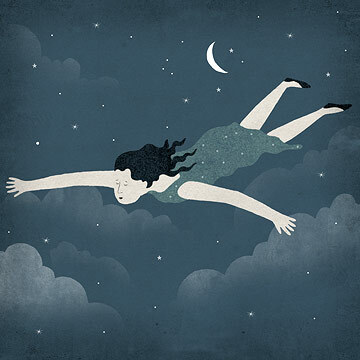 "Flying dreams fall under a category of dreams known as lucid dreams. Lucid dreams occur when you become aware that you are dreaming. Many dreamers describe the ability to fly in their dreams as an exhilarating, joyful, and liberating experience. If you are flying with ease and are enjoying the scene and landscape below, then it suggests that you are on top of a situation. You have risen above something. It may also mean that you have gained a new and different perspective on things. Flying dreams and the ability to control your flight is representative of your own personal sense of power." I was in a hurry so I decided to fly. I levitated as soon as I left the terminal and floated near the treetops toward a security gate of hurricane fencing. People were pointing to me, but I didn't care, I was making really good time. All of a sudden, a reporter began running on the ground trying to ask me questions. "How are you doing that?" he asked. "I make a counter force against gravity; it's very simple." I said. "But I have to concentrate to maintain it." "Who are you and have you been doing this long?" he asked. "I won't tell you my name. I've been doing this since I was a child." I answered. Meanwhile the gate guard begins running around in circles like a bug, worried I will cross the gate without identification. I know I have the right pass, but ignore him anyway and proceed to float across the area where the gate is. "Will you tell the secret of how you can do this?" the reporter asks. "Yes, I'm going to do a college seminar soon on how this works." I said. I woke up feeling absolutely wonderful, exhilarated and well-rested. In reality, we cannot really fly, of course. Thus, such dreams can be representative of things that are beyond your physical limitations. In your mind, you can be anybody and do anything. Another way of interpreting flying dreams is that these dreams symbolize your strong mind and will. You feel undefeatable and that nobody can tell you what you cannot do and accomplish. Such dreams are sure to leave you with a great sense of freedom. I guess my mind is saying, "Everything is going to be okay."